Teaching Under The Sun: Too Much Tech?!?!? With it being a long weekend, I decided to bring home all the devices I use in my classroom. After all, apps need updating, songs changed out, etc.. It is a good time. 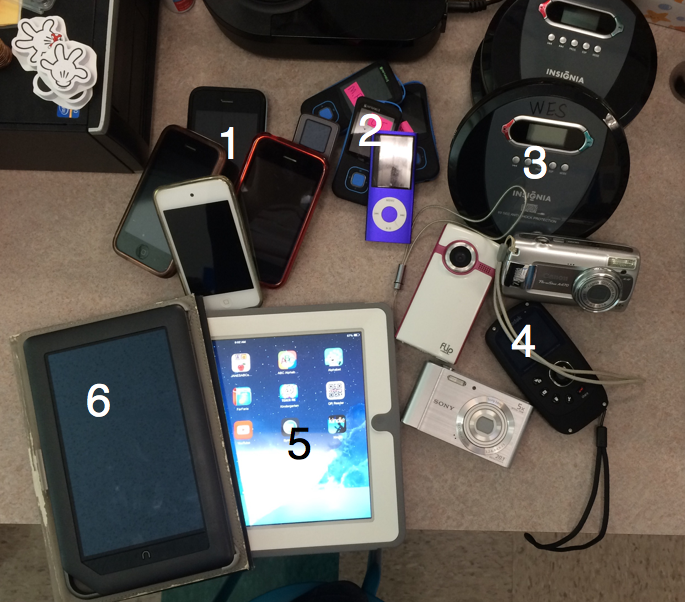 Just for fun, I collected all the devices I have available in my classroom and took a picture. WOW! Even I was a little amazed at what I have. This doesn't include the 6 desktop and 12 laptop computers. Here it is, in all its glory! With a brief explanation of how each item is used. 1. 3 iPhones (3GS) and 1 iPod touch. These are used daily during center time. The students work on Teach Me Toddler or Hooked on Phonics, depending on what they need. I use the guided access feature to make sure they are working in the correct app. 2. Various MP3 players and an iPod Nano. The Riptune MP3 players were purchased to send home with an Interactive Alphabet activity, but they are a little tricky to get to work. I am using them in the classroom with the activity in the classroom. I may use them for read along books in the future. The Nano is used with a student who is learning letter names. The student listens to a letter song while doing activities to practice the letter. 3. CD Players. Would you believe that CD players are hard to find and getting expensive. (which is why I was looking for cheap MP3 players) I use them with my books on CD. I color code the buttons so it is easier for my 5 & 6 year olds to work them independently. 4. Various cameras and video cameras I have gotten at trainings through the years. They are not currently being used. I am going to try Paper, Slide, Video projects next semester, these will come in handy. 5. An iPad 2. I use this in direct instruction. I play songs for small group time, use an app with the students, and use the FarFaria app for read alouds during assessment weeks. It keeps the kids engaged and learning while I assess the others one on one. 6. A Nook Color, the original one. This is great for the library center. I found several FREE read to me books on the B&N site and downloaded them. The kids love to 'read' the stories. Where did I get all this? The iPhones, iPad, Nano, and Nook came to school when my family upgraded our devices. The iPod touch was purchased with a Donors Choose grant a couple years ago. The MP3 players and CD players have been purchased over the years with our district adopt-a-class program funds. Why am I sharing? Well, I was recently told about the MobyMax tablet. I am getting to play with one this weekend. It is $69 and I think I want some for my classroom. I can already think of several uses. Plus the iPhones and iPod cannot be updated anymore. One day the apps will stop working. Maybe I need an intervention instead. I hope not. I kinda like technology!